Although Mission are perhaps better known as a leading UK manufacturer of hi-fi speakers, they have now launched their first active nearfield specifically designed for studio use. 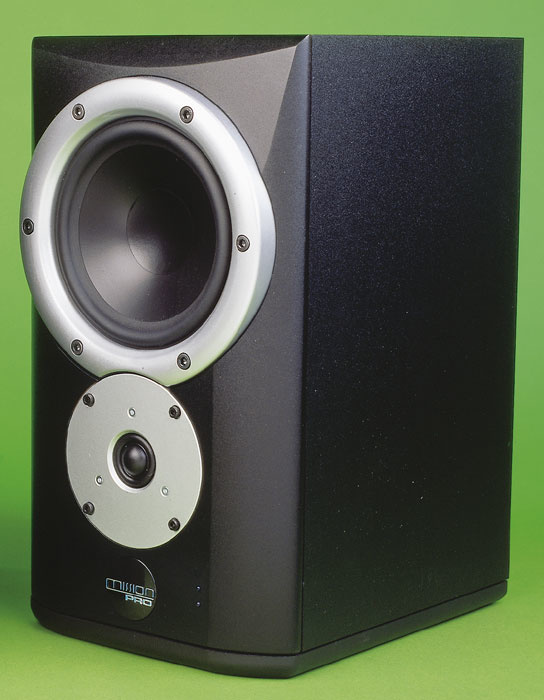 Paul White had a look at the SM6A's passive sibling back in SOS September 2003, describing a successful first foray into the studio market for hi-fi major player Mission. Now, with the launch of the active version, Mission Pro have pretty much the entirety of the entry-level monitor market covered. And without wishing to let the cat out of the bag and reveal my conclusions in only the third sentence of the review, they have it covered pretty effectively too! 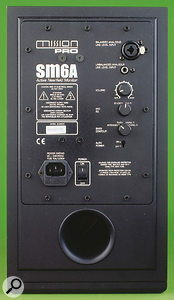 Photo: Mike CameronThe SM6A looks like a typical small active nearfield monitor, and in many respects it is just that. It does however include a few features and functions that mark it out in an increasingly large crowd. As ever, there's an amplifier module bolted to the rear panel of the enclosure that carries mains and input sockets, an indented gain control knob, and a power switch. Beneath the module there's a reasonably well flared reflex port — although not, unfortunately, flared on its inner end. Moving round the front, there's a 150mm bass/mid-range driver and a 25mm fabric-dome tweeter mounted on a profiled MDF front baffle. While the tweeter is a pretty ordinary-looking device, the bass/mid-range driver features Mission Pro's proprietary Paramid cone material, described as 'a sandwich of aramid fibres and pulp paper to form an optimum combination of low resonance and high rigidity'. Loudspeaker designers have, since time began, been searching for cone materials that display that 'optimum combination of low resonance and high rigidity', along with the vital, but missing from Mission Pro's description, low density. Using paper reinforced with fibre, as in Paramid, is one that generally works well and offers an effective compromise between the many conflicting cone material requirements. It's the one I'd look to first if designing a monitor of this type. At 32mm in diameter, the bass/mid-range driver's voice coil is significantly larger than would be typically found in a hi-fi speaker of similar size, and bodes well for the SM6A's thermal power handling and compression performance. The polished aluminium-look bass/mid-range driver chassis is not, however, all it seems. The visible part is actually a painted plastic bezel, the driver chassis itself being a separate item screwed independently to the front panel beneath. At best, the bezel offers some extra clamping force to the driver chassis; at worst it's just for looks. Mission Pro introduced inverted drivers (tweeter below bass/mid-range) on their hi-fi speakers many moons ago, and the SM6A is primarily intended to be used in this orientation. However, thanks to a rotating badge it can be mounted either way up (and sideways if convenience is really more important to you than potential monitoring accuracy). Inverting the drivers is one of those ideas that it's a wonder is not more popular. It's of benefit because, with a listening position typically just above the top of the enclosure, it equalises the path length between each driver and the listener — approximately time-aligning the drivers and ensuring that the integration intended by the crossover design is actually delivered at the listening position. Next time you see a 'time-aligned' speaker with a stepped or angled front panel, just ask yourself why the designers didn't simply invert the drivers and leave the front panel flat. Another sign that Mission Pro have worked hard at optimising the integration of the drivers is the steeper than average crossover filter slopes — fourth-order low-pass on the bass/mid-range driver and third-order high-pass on the tweeter. Steep filter slopes such as these are likely to result in a speaker that shows good frequency-response consistency off axis. Not only will this mean that there'll be less variation in sound at different listening positions than is likely with a more primitive crossover design, it also means that the basic character of the speaker is likely to be relatively uncoloured, as the tonal balance of the early side-wall reflections will be reasonably similar to the direct sound. Photo: Mike CameronNot only is the SM6A blessed with some sensible electro-acoustic engineering, some worthwhile thinking was also put into its use. The amplifier panel carries a comprehensive set of input sockets — balanced XLR, balanced/unbalanced quarter-inch jack, and unbalanced RCA phono. For once, with an active speaker, there's no excuse for not having a workable signal cable to hand! There's a signal-sensing automatic switch-on feature, and the amplifier panel also plays host to two knobs: a Bass Contour knob that dials in one of four low-frequency response shapes; and a Mid EQ knob that provides Studio and Hi-fi options. The latter control is intended to provide either the tonal accuracy of a nominally flat frequency response (the Studio option) or the attenuated mid-range said to be typical of a hi-fi speaker. I have to admit to a little scepticism about the real-world value of these EQ fiddles. Leaving aside the fact that it's a pain to have to reach around behind the speaker and flick a switch, and that these days it's so easy to insert a global EQ on the monitor output, the complexity behind the perception of tonal balance with a particular monitor located in a particular position in a particular room is such that simple, broad-brush equalisation can't really hope to do anything but make things sound different — not really better, or more accurate, just different. 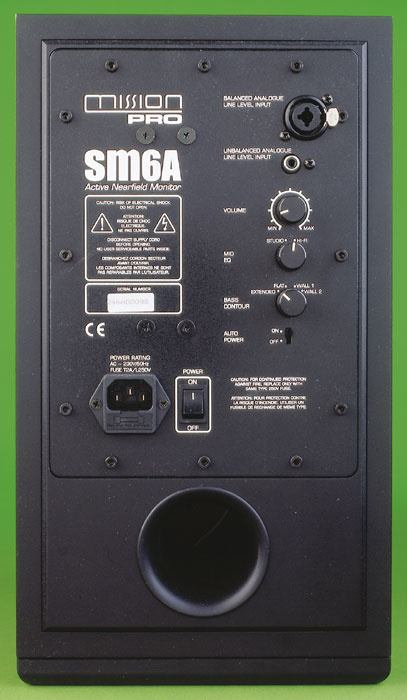 Having said that, it may well be that one of the SM6A's low-frequency response shapes will suit a particular listening environment slightly better than others, but there's no way it will rescue inappropriate speaker positioning or solve room-acoustic problems. Similarly, it might be in some applications that the sound of the SM6A is preferable, or even more useful, with the EQ switch set to Hi-fi, but my experience of the tonal balance of hi-fi speakers is that they range from seriously recessed in the mid-range to outrageously boosted. There is no 'typical' hi-fi speaker mid-range balance. Enough carping! I wrote in the opening paragraph that Mission Pro have the small active monitor market covered effectively, and so they do, because the results when you actually get to switch on and use the SM6A are good. The speaker's most impressive attribute is its mid-range character, where it pulls off the unusual trick of being at the same time well-balanced, uncoloured, and analytical. I felt I could work with it right from the start, with judgment of mid-range balance, while hearing right down into the tail of a reverb, made easy. Further up the bandwidth, the SM6A's top end seemed balanced slightly on the bright side (ironically, high-frequency balance is the one area where simple EQ fiddles can work) and if I were to use the monitor full time I'd probably set up a simple HF shelf EQ (perhaps -1dB from 4kHz up). The basic quality of the tweeter is good though, and I'd have no problem listening to it for extended periods. I was impressed too with the SM6A's dynamic performance and ability to play loud without falling apart, both in terms of performance and construction. My needs in this respect are never particularly extreme, but the SM6A exceeded them by no small measure. It appears unafraid of hard work. If the SM6A disappoints in any area, then it's at the bottom end of the audible range. I'm no great fan of reflex-loaded speakers and, whatever the position of the Bass Contour control, I felt I could hear the slight bass transient blurring and indistinct pitching typical of the technique. The effect was mild — although the SM6A's bass isn't perfect, it's still perfectly competitive — but I was reminded once again of why I believe sealed-box speakers work better, and I was left wondering why manufacturers are so wedded to choosing bass extension over bass accuracy. Good dynamics and high-level performance. Useful range of input connections. Bass not perfect — should have been a closed-box design. A usefully competitive product from Mission Pro, and at this UK price you can't go wrong. £599 per pair including VAT.